Bridgestone’s R11 is the first DOT race tire to come from the company since they left MotoGP. 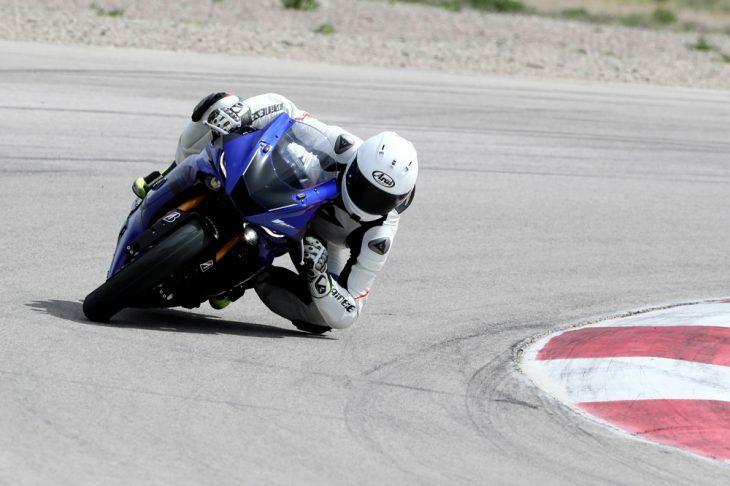 We headed to Utah Motorsports Campus to see what all the fuss was about. You wouldn’t be able to pull this kind of lean angle unless your front tire was extremely good. It’s been two and a bit years since Bridgestone left MotoGP as the control tire supplier, and now we are finally starting to see the fruits of the company’s long and expensive labor on the world stage. 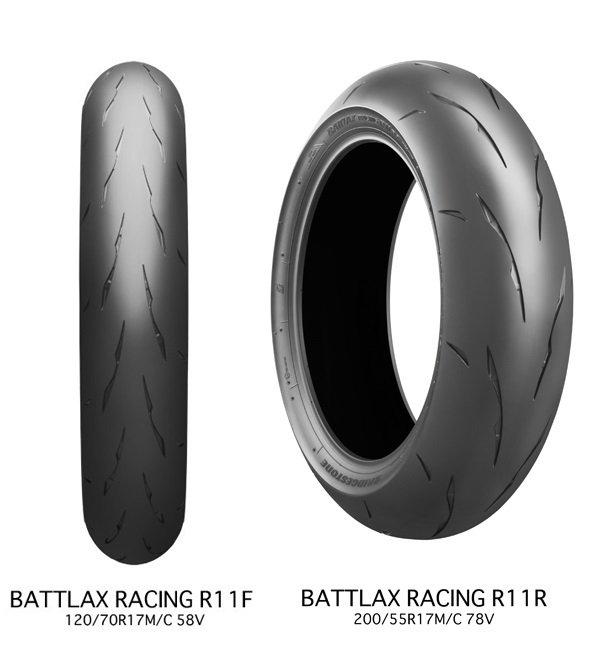 The new Battlax R11 DOT race tire is the replacement for the R10 that came out way back in 2011—albeit with subtle tweaks and revisions—and sits third in line in terms of out-and-out race rubber behind the slick Racing Battlax V02 and W01 but ahead of the RS10s that come standard on bikes like the Yamaha YZF-R1. The R11 will now fit everything from a YZF-R3 to a YZF-R1M — but if you don’t have a Yamaha, doesn’t matter! The DOT race tire is not suitable for street use, as it needs tire warmers to get into the right operating range to work hard from the get-go. Think of it as a slick with select grooves cut into it. For street use only, the number-one tire in Bridgestone’s arsenal is the RS10. 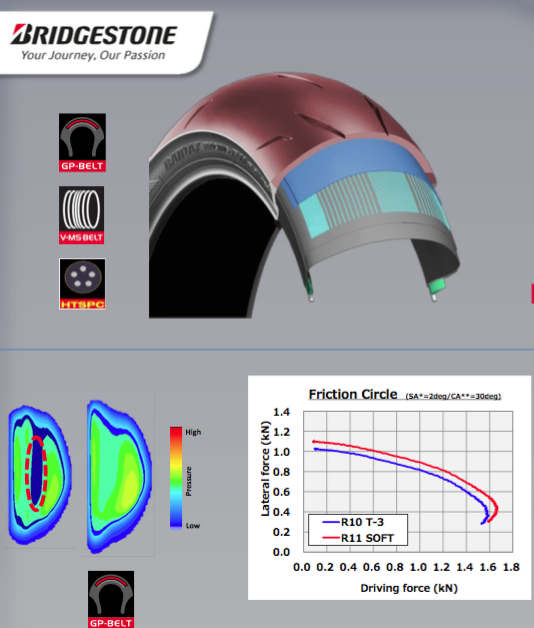 Bridgestone’s Ultimat Eye technology has been largely responsible for creating the new tread design. Under the new tread pattern, Bridgestone has introduced the Variable Monospiral Belt (V-MSB) construction for the carcass. There’s still the traditional hard center belt construction to aid high-speed stability, but the side belts are now spaced to put more of the contact patch on the ground at high lean. 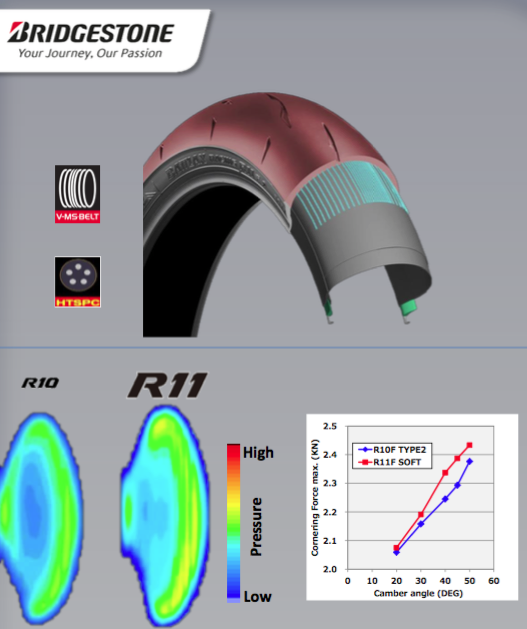 According to Bridgestone, the tread on the R10, with its old-school Monospiral Belt (MSB), would cave in slightly at full lean in the center of the contact patch. The result was there was less tire on the ground than there could have been for when the throttle was opened. The Variable Monospiral Belt (in blue) means you now have more tire on the ground at high lean. The heat graph and bottom left shows how the low-pressure area of the previous R10 has been eliminated. The V-MSB now fixes that and it has an extra partner in the rear tire, which uses what Bridgestone calls the GP Belt. This sits over the top of the V-MSB and helps provide extra stability and rigidity, as well as keeping more tread on the ground under hard acceleration—something the front tire obviously doesn’t have to deal with. 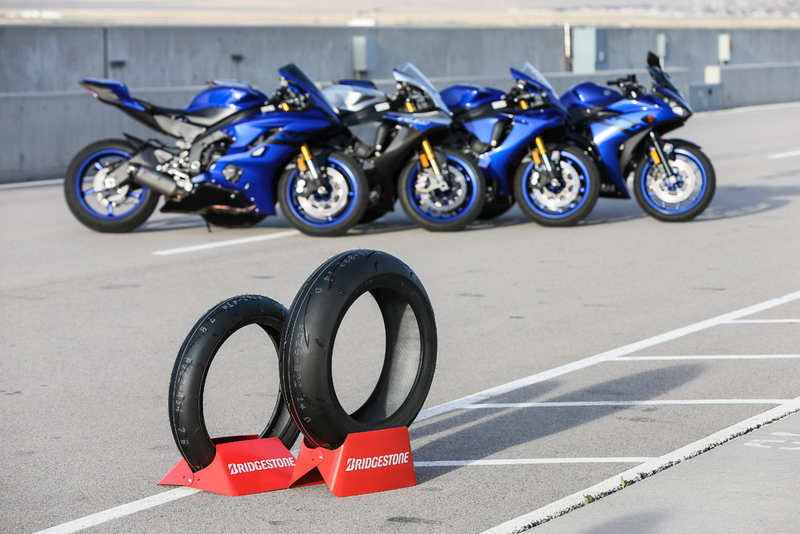 The R11 is also notable because this is the first DOT race tire to come from Bridgestone as part of a full range, going from 160 to 200 sizes on the rear and 110 and 120 sizes on the front. 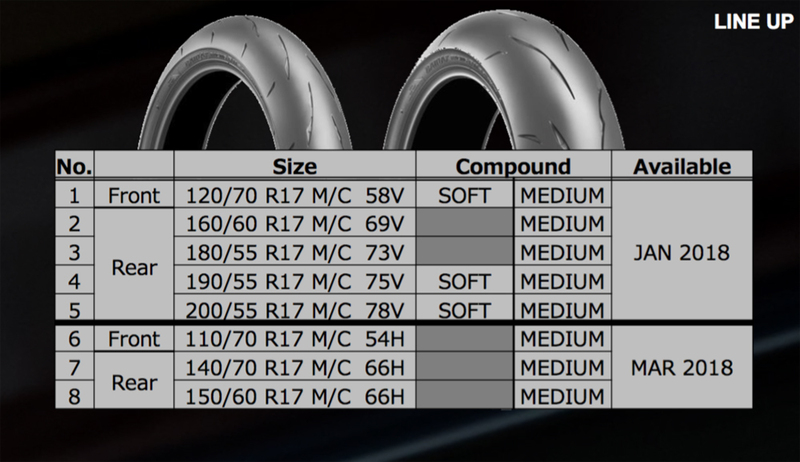 Here are all the sizes you can run with a Bridgestone Battlax R11. The opportunity to test the Bridgestone Battlax R11 came over two superlative days at Utah Motorsports Campus on four different Yamaha motorcycles—the YZF-R3, YZF-R6, YZF-R1 and YZF-R1M—tire warmers and all. As mentioned, the R11 can now be fitted to pretty much any track/race bike you can think of, so we started the test with a full day on Yamaha’s YZF-R3. The R3 is about 50 pounds lighter than something like the R1, and comes with less than a quarter of the horsepower. As you can imagine, this bike didn’t stress the tires anywhere near as much as the big bikes, but the Bridgestone R11 was quite happy to let me play about with diabolically late braking and corner entry and still make the corner. The R11 rear tire gets the GP Belt (dark blue) that runs over the top of the V-MSB to help give more stability under hard acceleration. The rear R11’s acceleration grip was unquestionable with the Yamaha YZF-R3, as there’s only about 36 horsepower to get to the ground. You could get absolutely stupid with the throttle and the rear would simply stick and lurch me forward (almost) regardless of what lean angle I was carrying. What did stand out was the front-end grip at full lean, as the lightweight R3 can carry rather silly mid-corner speeds. I would always know where I was with the front of the R3, with loads of feedback coming from the tire. This was clearly a good omen for the second day when we would switch to the big bikes. 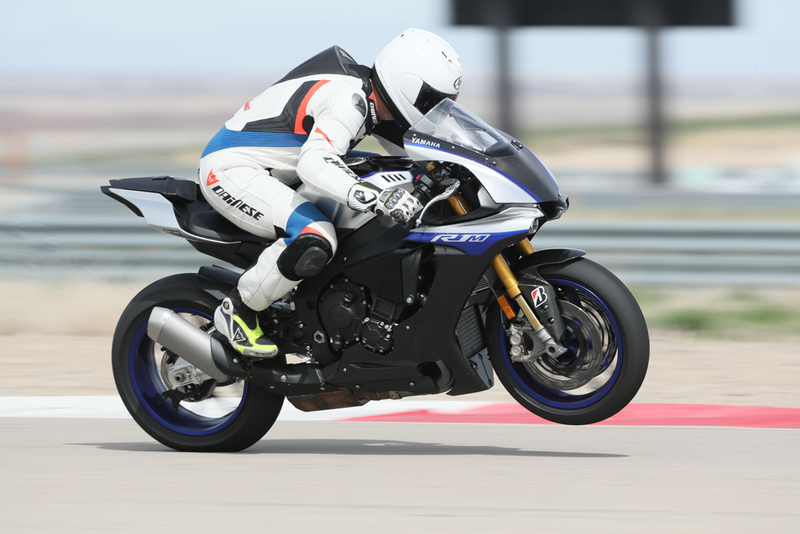 Dancing between a Yamaha YZF-R1, R1M and finally a half day on an R6, what rang true about my time on the R3—outstanding front-end feel and grip—was magnified on the big bikes due to the higher speed and weight. The red outline is the new R11, the blue the old R10. It’s a pretty convincing gain across almost every aspect of performance, especially on corner entry. Heading down the Utah Motorsport Campus West course into the 180° left turn one, it was simply a matter of how brave I would be before letting off the gas. The deeper I braked, the better the tire would grab hold of the pavement. 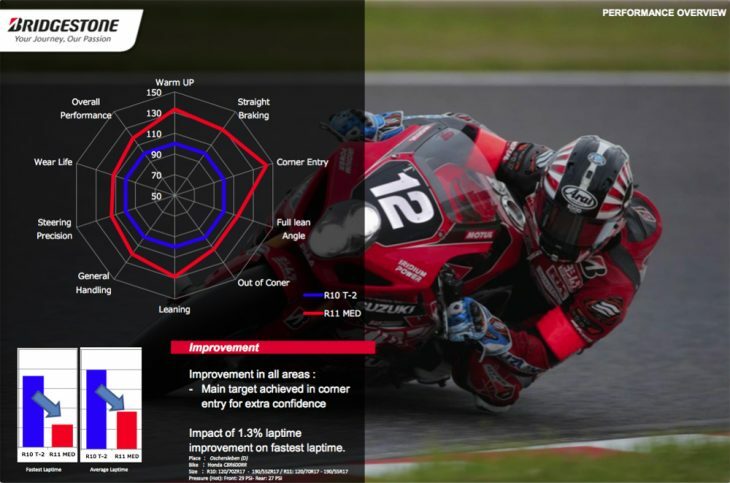 The R11 gave very similar performance to the V02 slick tire we tested during the world launch of the 2015 Yamaha YZF-R1M at Sydney Motorsport Park in Australia, if only just lagging a touch on acceleration—but that’s no criticism because the V02 is an absolutely awesome race-slick tire. 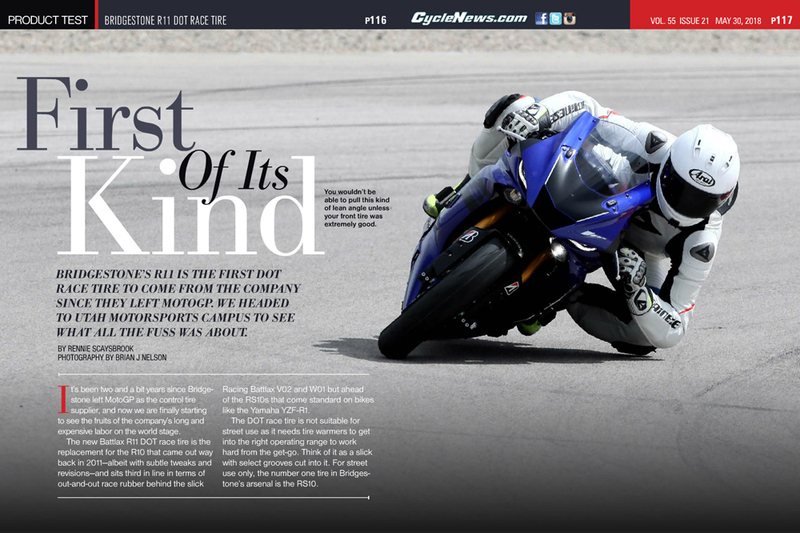 The R1M felt like an absolute jewel when fitted with the race-spec R11s. On acceleration the R11 was again flawless, allowing you to dial in huge amounts of throttle on corner exits with rock-solid stability. The longest time I spent on a big bike was with the R6, and here the R11 had more grip on offer than the R6 could fully exploit. The R1 and R1M would naturally make mincemeat of the R11 (or any treaded tire for that matter) after about four half-hour sessions; the 600cc Yamaha had just the right amount of horsepower not to overstress the tire, while still being able to exploit all the advantages the Bridgestone could offer. Click here for more New Products on Cycle News. Rennie Scaysbrook | Road Test Editor Rennie Scaysbrook is our Road Test Editor. A lifetime rider, the Aussie made the trek across the Pacific to live the dream in the U.S. of A. Likes puppies and wheelies. Road America: Who Can Stop The Streaking Elias?